Monthly Means: 1850/01 to 2015/12. 1.0 degree latitude x 1.0 degree longitude global grid (360x180). 89.5N - 89.5S, 0.5E - 359.5E. See the reference below for more information. From the abstract "A new sea surface temperature (SST) analysis on a centennial time scale is presented. In this analysis, a daily SST field is constructed as a sum of a trend, interannual variations, and daily changes, using in situ SST and sea ice concentration observations. All SST values are accompanied with theory-based analysis errors as a measure of reliability. An improved equation is introduced to represent the ice-SST relationship, which is used to produce SST data from observed sea ice concentrations. Prior to the analysis, biases of individual SST measurement types are estimated for a homogenized long-term time series of global mean SST. Because metadata necessary for the bias correction are unavailable for many historical observational reports, the biases are determined so as to ensure consistency among existing SST and nighttime air temperature observations. The global mean SSTs with bias-corrected observations are in agreement with those of a previously published study, which adopted a different approach. Satellite observations are newly introduced for the purpose of reconstruction of SST variability over data-sparse regions. Moreover, uncertainty in areal means of the present and previous SST analyses is investigated using the theoretical analysis errors and estimated sampling errors. The result confirms the advantages of the present analysis, and it is helpful in understanding the reliability of SST for a specific area and time period." Note the ICOADS Rel. 2.5 (http://icoads.noaa.gov/) was used in the analysis. Missing grids are -9.96921e+36 (ltm). Please note: If you acquire COBE-SST2 data products from PSD, we ask that you acknowledge us in your use of the data. This may be done by including text such as COBE-SST2 data provided by the NOAA/OAR/ESRL PSD, Boulder, Colorado, USA, from their Web site at https://www.esrl.noaa.gov/psd/ in any documents or publications using these data. We would also appreciate receiving a copy of the relevant publications. This will help PSD to justify keeping the COBE-SST2 data set freely available online in the future. Thank you! Hirahara, S., Ishii, M., and Y. Fukuda, 2014: Centennial-scale sea surface temperature analysis and its uncertainty. J of Climate, 27, 57-75. http://journals.ametsoc.org/doi/pdf/10.1175/JCLI-D-12-00837.1 . Hirahara, S., Ishii, M., and Y. Fukuda, 2014: Centennial-scale sea surface temperature analysis and its uncertainty. J of Climate, 27, 57-75. Folland, C. K. and D. E. Parker, 1995: Correction of instrumental biases in historical sea surface temperature data. Q. J. R. Meteorol. Soc., 121, 319-367. 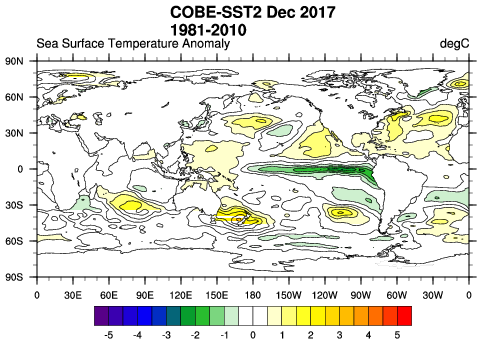 Japan Meteorological Agency, 2006: Characteristics of Global Sea Surface Temperature Analysis Data (COBE-SST) for Climate Use. Monthly Report on Climate System Separated Volume, 12, 116pp. COBE2 files and a README are here https://amaterasu.ees.hokudai.ac.jp/~ism/pub/cobe-sst2 (grib format). Ice is in the files in addition to SST.